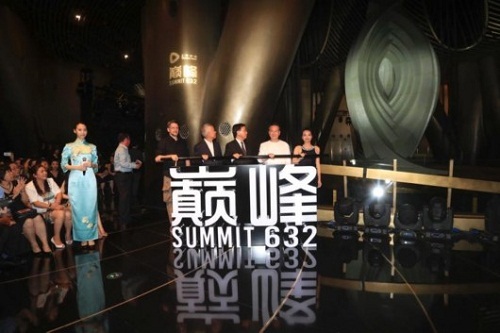 The curtain on Summit 632, the world's highest communal space for science, culture, and art, was lifted at Shanghai Tower, China's tallest building, located in Lujiazui, Pudong New Area, on Aug 28. The space, situated on the 125th and 126th floors of the tower, is 583.5 meters from the ground. The designer opened up the ceiling of the 125th floor, making the internal height of the space 23 meters. One highlight of the space is the world's first eddy current pendulum tuned mass damper, which can reduce the swaying motion of the building and improve its safety and comfort level. It is the first time that such a damper has been installed on a super high-rise building. A multimedia interaction exhibition is launched to use advanced technologies such as 3D and somatosensory interaction to explain the working principles and functions of the damper, helping visitors understand the equipment better. Above the damper stands a sculpture bearing a resemblance to an eye. The inspiration was from the eye of a powerful red dragon in Shanhaijing (The Classic of Mountains and Seas), a collection of mythical legends written more than 4,000 years ago. When the dragon opens its eyes, the daylight comes. When it closes its eyes, the night comes. Cutting-edge holographic sound technology is used in the space, making it a perfect venue for professional music performances. Simon Franglen, a world-class British musician, composed a song One Day in Shanghai especially for the space. Currently, people who want to visit the space have to book a customized service via the hotline 021-20656998. A guide will be arranged to show visitors around the space. The space is available at 14:00, 16:00, 18:00, and 20:00 every day, and a maximum of 30 visitors are allowed to enter at any one time.